Concieved of, implemented, launched and operater the service Your Shared Secret. A cloud service for making sure important information you have is not lost if you are gone. The service operates on a zero trust basis where no confidential information is ever known to the service. Consulted on the Aphelion project which is a distributed crypto currency exchange. Smart Moisture Sensor iOT device. Consulted on project where I created the mobile app for Android and iOS with the corresponding back end service for reporting data into for Smart Moisture Sensors. Passed the AWS Certified Solutions Architect Professionals exam. This one took more than 3 days of studying though. Developed a skill to control my thermostat using Amazon Echo. Also created another skill to help keep track of if you have fed your pet. I also created another one to play Z-Machine games using the Echo but I haven't figured out how to release it yet due to copyright issues of the actual games. Helped developed the firmware for an embedded controller of a device to perform eye surgery in C and ARM assembler. After studying for a total of 3 days I sat for the exam to become a AWS Certified Solutions Architect and passed. Developed a system for dynamic provisioning of resources for doing continuous integration using the Jenkins build engine and Skytap cloud service. Based on a service that does provisioning of resources written in C# and a Jenkins plugin that makes it easy to create machines when needed to run a specific job. Disclosed several inventions that have been filed with the US patent office by DELL and Amazon in varying fields of computer science from database theory, identity management, machine learning and more. Currently the following patents have been granted. Here is a full list of what filings are currently public. Underscore Notify is a note taking application for the iPad and iPhone. It is unique in that it features a virtually unlimited canvas size leading to interesting memory management issues on an iPad. It also integrates with several cloud services for synchronizing the notes. The application has been the number one paid app in several markets and been featured by Apple. Underscore Price Check was a barcode scanning price comparison app developed from scratch for the iPhone in Objective C. At the time there were no such apps available, unfortunately Apple took almost 3 months to approve the initial version and by that time other apps had already come out. This application became the number one free app in several markets. I got tired of keeping up with Apple's changes to the camera API so the app is no longer available. Created a system for collecting and processing usage statistics collected from several applications at Quest Software. A PERL backend processes the collected data into a useful data warehouse format placed in a MySQL database. The software is currently processing over a million new data points per day and the data helps us guide future development of our products. Lead architect for several database development and administration applications including Toad Data Point, Toad for MySQL, Toad for SQL Server, Toad for SAP and Toad for DB2. The applications are all based on the same platform and is developed mostly in C# with certain pieces in managed C++. Helped a project optimizing an 2Oracle Apps application run by the Norwegian IRS to help manage the distribution of collected tax revenue. Designed, implemented and deployed a CRM system for Spinbox AB. The back end of the system ran on Java with an Oracle database. The front end was written in C++ using Qt for the UI. Design, implementation of Toolkit" for Oracle. Originally an open source project I developed because I needed a Toad for Oracle like tool that would run on Linux. I later started selling the application in a version for Windows. It is developed in C++ using Qt for the cross platform UI toolkit. In 2003 I sold this intellectual property to Quest Software and was hired by them. The open source project is still active to this day though by other volunteers. Design, implementation and launch of the system for handling the accounts in the Swedish Premiepension (PPM) system. In this project I was one of 3 initial designers of the system which will handle in excess of $50 billions of investments for roughly 7 million clients. The system was built on PERL using an Oracle database. On launch day it invested almost 100 million Swedish Kronas in mutual funds. Our system was built in less than 6 month before launch by roughly a 10 people team and replaced a non working original system that had been developed by CSC for roughly 3 years by a team of 50 developers. Part of a team that developed a new next generation and easily extendable mediation device for the BSCS telecom billing software. Built on C++ and extensible using its own easy to tweak macro language. The software was sold by CapGemini in Sweden to their BSCS customers. Developed and launched a web application that handles communication for a small to medium sized company. Built on PHP using a MySQL database. Used internally by GlobeCom AB and several of our customers. Worked with optimizing reports taken from a Telecom billing system dealing with call data records for TeleStet, Greece. The reports were written in C++ and the database used was Oracle 7.3. Made a specific mediation device for a Telecom billing software able to talk to a new kind of switch for TeleStet, Greece. A mediation device is the software that the Telecom billing software talks to actually make changes in the telecom network. I wrote a program to migrate from an old telecom billing system to a new one for TeleStet, Greece. This involved moving a huge amount of historical call data records and the amount of time available for the migration was very limited since all their retail stores would need to be closed during the time the system was upgraded. The data came in text files and needed to be transformed and then loaded into an Oracle 7.3 database. The billing software migrated to was BSCS. Developed a web based jukebox originally to play music in our offices. This is the longest running project of my life since I am still working on it. The first version was written in C++ and used the proprietary DBServ database engine. It was later rewritten from scratch in PHP, MySQL and PERL. Originally it only played music but several years later I added video playback and it is currently running my multi room home entertainment system. The video version was originally based on Xine, but I later moved to a heavily customized XBMC build. There is also an Android based streaming app to enable me to listen to my music on the go. An old version is still available as open source from http://gjukebox.sf.net/. Long before Napster I developed and ran an MP3 search engine that crawled the web and FTP for MP3 files. It was only live for around one month before I took it down due to the legal ambiiguity of the whole area. During the one month it was live it had over 1 million unique users. Developed many web sites for clients of GlobeCom AB inn C++, PERL and later PHP once that was available. We were mostly using either Roxen or Apache web servers at the time. Development of mediation device for a Telecom billing system for Telia Data in Sri Lanka. A mediation device is the program that sits betwween the billing system and the telecom network equipment that actually provisions the services added in the billing system. Developed a high performance database server DBServ. It was never released as a product but was used in many web sites developed by GlobalCom AB. Initial setup of servers for a new internet service provider Internet One (Later acquired by GlobeCom AB). Also helped set up routers and modem pool and developed rudimentary customer management software. Developed a math education software for Windows for GlobeSoft (Unfortunately now defunct). Helped a small mechanical engineering company to extend their CAD software to improve productivity in regards to designing power plants. The CAD software in question was ME10 by HP. Among the software design was a system for generating bill of materials and also a very extensive set of macro's for drawing ISO standard pipes, joints, screws and bolts. The company also required several pieces of software to do advanced calculations on the behavior of steam which needed to be developed. Some of these were made in C, C++ and some were in Fortran. Also included in the job was making sure all of their computer systems were running smoothly since no other employees had this expertise. 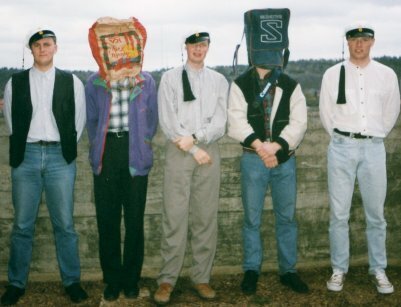 Helped organize the hacking event Cromputer Cross Roads 1993. 1600 people showed up, making it the biggest Swedish event of its kind upto that time. Later in the year the Cascada group also release a Christmas demo which featured code that I helped develop. Designed, implemented and deployed a system for gathering statistics from a small power plant so that it could be studied from a normal PC. I have been working professionally for over 20 years doing software development and 30 years all together. I am very familiar with all aspects of the software development life cycle and have no problem guiding a project from nascent idea all the way to completed and launched product regardless of whether it is a desktop application, mobile app, web site or software as a service. I live and breathe software development and due to my passion for this field I try to always stay current on new trends, technologies and tools. I have no problem working on a project where I am the single technical contributor or as a larger team where I am used to mentoring junior members of the team to help improve their skills and output as well. Due to my breadth of knowledge of the field I am generally very quick to get up to speed with a project and being able to start delivering. I have had several consultancy projects in the past where a task estimated to take several weeks have been completed in a matter of days. Working at Amazon to improve the mobile offering. This job involves working with truly big data and creating the reliant and resiliant cloud services of the future. Due to the tax complications of owning a Swedish company I had to relinquish my shares in Underscore AB in 2013 and formed this new company with my wife Lisa to be able to handle contract work in the United States now that I have my green card. I originally came on board at Quest Software as part of an acqui-hire deal with Underscore AB where Quest Software acquired the software TOra and myself for 3 years. While here I have been working on many different projects but during most of my time I have been the principal architect for several of the products in the Toad family. This has allowed me to become familiar with many different databases and also get acquainted with many new emerging technologies like cloud computing and No SQL databases. In 2012 Quest Software itself was acquired by DELL Inc although my position did not change. As part of my work here I am also spending a lot of time mentoring junior members of the team to help them improve and develop as professionals. At Spinbox I was the only on staff software engineer and worked with several software projects revolving around developing customer care solutions for their cell phone provisioning and customer service. I helped design develop and deploy systems for helping the company do in house customer care, business to business services and customer facing self service solutions. Quite often this also involved coming up with new ideas on cell phone services, particularly in the area of data traffic. I founded GlobeCom with some friends. This was an ISP, web hosting and computer consultancy company. At its peak it had roughly 30 employees. I was involved with most technical aspects of the company especially in the first couple of years. During later years I tended to drift more and more into software engineering consultancy where I tended to work on longer running projects as a product architect while still being deeply involved with the actual implementation side as well. Founded and ran a small computer consultancy company with me as the sole consultant. Over the years this company has been doing both various different consultancy work and also published several applications to various mobile app stores. It also developed a database development tool later sold to Quest Software in late 2003. Development of CAD software and mathematical modelling software to help the team design power plans. I was also the only technical person on the payroll so I also handled administration of a small group of HP-UX Unix servers and work stations. At the time one of the most respected "demo" groups on the PC scene. Studying for a master's degree in electrical engineering and civil engineering. 12 months of military service. Served as system technician, educated into making sure all electronics at a regiment level was operation. 3 years of technical gymnasium (High School). Specializing in electrical engineering. 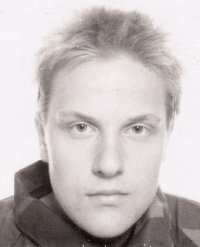 The photo taken for my military ID. I can totally see this guy holding up a 7-Eleven. I was born in 1973 and grew up in the small Swedish town Karlskoga. I left there 3 days after graduating high school where I studied electronics for 3 years at Bergslagsskolan. Before that though a monumental moment in my childhood was when I at the age of 10 got my first computer. A Commodore 64 which I completely fell in love with and which started an obsession in trying to learn as much as posible on how it worked... An obsession that have only in part abated now even though the computers have changed during the years the facination with their inner workings have not dissapeared. My first stop after leaving the town I grew up were in the military service where I served 12 months as an electrician and I can honestly say in retrospect that that is a year of my life that I want back. As some of my friends in Sweden know I hold nothing except the highest distain for anything military. Me and the gang at Chalmers. Counting from left to right: Jorgen, me, Peter, Stefan and Jerker. After my military service I managed to get my first job at AB Tore J Hedback where I worked for the summer helping to administrate their UNIX workstations and develop CAD solutions. A job I continued doing off and on for the next couple of years. After that I was off to Gothenburg where I started attending Electro engineering at Chalmers University of Technology. It was also around this time that I started to suspect that there might be more to life than just computers (Not to say computers aren't important). During this time I also started my first company Underscore AB which was originally just a way for me to be able to earn a little bit of money and still keep my student funding. At school I met a great bunch of guys which I spent a lot of time eating pizza and pretending to study with for quite some time. Around this time I also picked up another hobby which is inline skating. Something I am still passionate about and do on a regular basis. A few years later I was even involved in organizing the Stockholm Sunday Skates where we got a whole bunch of people together and skated around Stockholm. At timmes we were over 100 people doing the skate and we had a lot of fun. While at Chalmers I also met up with another group of people who seemed to agree on the fact that you should probably be able to make some money on this "new" internet thing (Which was just starting to reach the mainstream at the time in Sweden) and after some carefull consideration we started a company working with it which was GlobeCom (In 2005 GlobeCom was bought by Bahnhof Internet and has ceased to be a separate corporate entity). 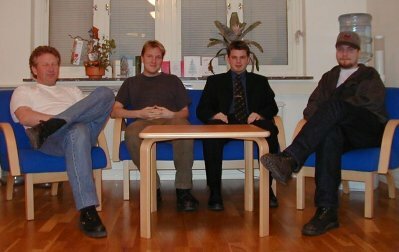 I started working full time with GlobeCom somewhere around 1995 which was my second year at Chalmers. This unfortunately did affect my studies eventually and I never managed to graduate from Chalmers. In the end I finished around 3 out of 4 and a half years of full studies... But I did it in 6 years and then they stopped sending me mail. To my defence though before I started with the GlobeCom project I was on target with my studies. It was while starting with GlobeCom I got my nickname Mauritz to distinguish me from one of the other partners called Henrik Johansson. Initially, as with all startups, it was rough in the beginning. And it took a long time before we could get by on our incomes reliable. All the time everyone I knew was adament about that I really needed to finish my studies no matter what. And there was a lot of strife and hardship getting GlobeCom off the ground. But in retrospect I don't regret a second of it, because I made some of the best friends I've known during the process and I came out the other end with a lot of experience in real life. Something you just do not get from a regular College education. As we started getting off the ground with GlobeCom I moved away from pure ISP and website building into being a regular computer consultant. This is also what I've been spending most of my professional life doing since this time. I have been working in a lot of different industries and locations. From finance and telecom to tourism. From Singapore and Greece to Los Angeles. In 1998 I spent a year in Athens, Greece working for a local mobile phone operator. By the time I was going back to Sweden, everyone I knew had pretty much moved from Gothenburg to Stockholm... And so did I, because that was where all the work was. And this is also where I ended up staying until 2002 when I finally left GlobeCom, mainly because I felt like I needed to try something else having worked with the same company for 7-8 years (Depending on when you count I started for GlobeCom). After I stopped working for GlobeCom I got my first "real" job. At the age of 29 I for the first time wasn't at least partially my own boss. I went to work for the small cell phone operator Spinbox AB and it was quite a large change for me at least. Before this I had started on a small project that would change my life considerably in a year or two though. During a previous project I worked on at PPM. I needed a tool for querying Oracle databases and started on a program called TOra. By the time I started at Spinbox I had started selling this application over the internet and it brought me pretty much as much money as my regular day job salary. During this time I also really fell in love with the city Stockholm and even bought my own appartment. That was not to last though. In the spring of 2003 I was contacted by the company Quest Software which basically wondered if I wouldn't mind selling a competing product to their product Toad and come working for them. Basically they made me an offer I couldn't refuse and I was off again. This time the destination was southern California. 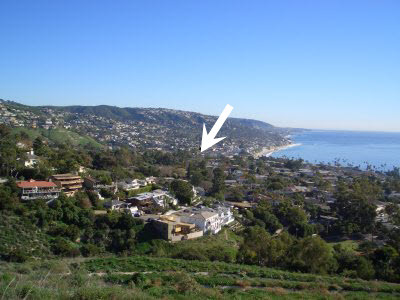 View of Laguna Beach, you can almost make out my house in the middle here (My house is just behind those trees by the arrow). In february 2004 I made the leap of moving from the comforts of home to join Quest Software in the city of Irvine just south of Los Angeles. After moving around a bit I finally found my new home in the city of Laguna Beach where I now lived 5 minutes walking distance from the beach and am loving every minute of it for exactly 10 years to the day before I moved again and this time around I did not go that far, just a few miles north to Long Beach. During this time the company I work for has also been acquired and I now work for DELL. So if working for a large company was unusual for me when I worked for Quest Software which had around 3000 people, it is even stranger now when DELL has around one hundred thousand employees. During this time I have worked on many projects but most of the time I have been involved with the design and development of the products Toad Data Point, Toad for MySQL, Toad for SQL Server, Toad for SAP and Toad for DB2 among others. While living in the United States I've also pick up a lot of new hobbies like paddle boarding, motorcycle riding, frisbee golf, regular golf, lawn bowling and others. I've also really come to look at Laguna Beach in particular, but Southern California as my home. I have also finally after "only" a little bit over 10 years living here finally received my green card. And lastly I have met my wife here. The lovely and beautiful Lisa DuMouchel (Now Lisa Johnson). We met through a common friend while she was living in San Francisco in early 2012. A little bit over a year later we were married on the 4th of October 2013 at the Saint Regis Monarch Beach in Dana Point. She is also the reason that I will now be moving as she is persuing a PHD degree in Santa Monica so we are splitting the commute. All my photos are available on Google+.